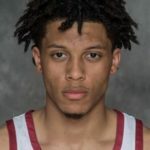 Iowa State sophomore guard Lindell Wigginton has been named to the 2018-19 Preseason All-Big 12 Team, as voted on by the league’s head coaches. Wigginton’s fellow sophomore, Cameron Lard, received honorable mention recognition. Wigginton is the Big 12’s leading returning scorer after averaging 16.7 points per game as a freshman. The Dartmouth, Nova Scotia native shot 40.1 percent behind the arc and hit an ISU freshman record 69 three-pointers. An All-Big 12 honorable mention selection and member of the Big 12 All-Newcomer team last season, Wigginton scored 20 or more points in 13 games, including the final four games of the 2017-18 season. Lard averaged 12.6 points and 8.1 rebounds during his redshirt freshman campaign. The Natchitoches, Louisiana native was second in the Big 12 in field goal percentage (.601) and third in blocks (2.2) en route to earning All-Big 12 honorable mention accolades for the 2017-18 season. He paced the Big 12 with 3.4 offensive boards per game. The Cyclones open the 2018-19 season at Hilton Coliseum on Tuesday, Nov. 6 against Alabama State.